Soy milk ramen • Quick & Tasty - Get Cooking! 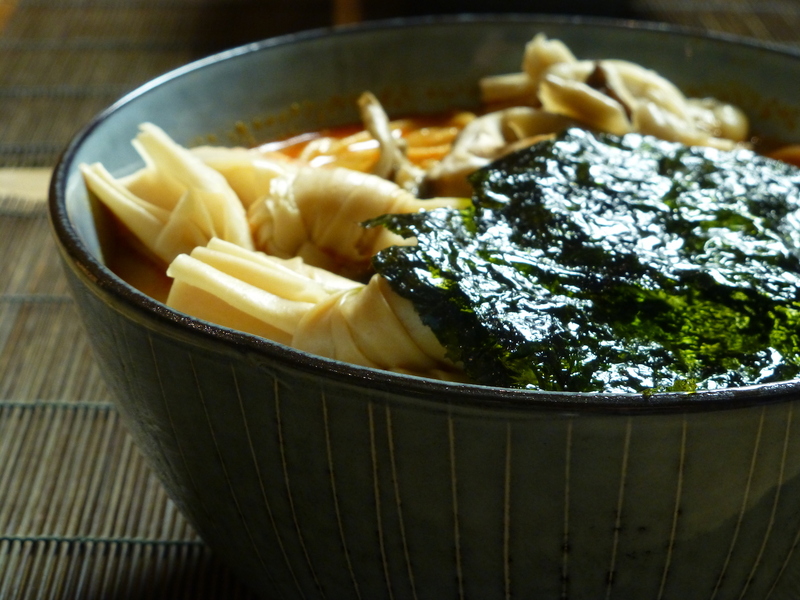 Ramen is a very popular dish in Japan, but it is usually not vegetarian. This is a delicious recipe for vegan soy milk miso ramen (豆乳味噌ラーメン), very similiar to the recipe from JustOneCookbook. There are a few ingredients in this recipe that may be a bit harder to find, but it is really worth the effort! I bought these at a Chinese supermarket. Fermented broad bean paste (called doubanjiang in Chinese) is essential. Make sure to check the ingredients as there are many types of chilli bean paste and a lot of them are not vegetarian. The Chinese characters are 豆瓣酱. If it says 辛豆瓣酱 then it will be very spicy. The brand I got is Pearl River Bridge Chilli Bean Paste. The kombu seaweed is also essential to make dashi. I bought a Korean brand, A+ Hosan Dried Kelp. For the topping I used dried beancurd twists (called yuba in Japanese, bai ye jie in Chinese), you can of course use another topping. The brand I got is Yilin Dried Beancurd Twists. For the topping I also used ajitsuki nori (roasted, seasoned nori seaweed). I bought a Korean brand, A+ Hosan Roasted Seasoned Sea Laver. All the other ingredients can be found in ordinary supermarkets. To make the dashi, soak the kombu and dried shiitake in 250 ml water, either overnight in cold water in the fridge or for half an hour in hot water. Then heat the dashi in the microwave for 4 minutes at full power (900W), taking care not to boil it. Remove the kombu and shiitake from the dashi. Soak the yuba knots in hot water until they are soft, then drain. Cut the mushrooms, wash them and microwave them for 2 minutes at full power (900W). To save time, bring 2 l of water to the boil for the ramen. In the meantime, fry the ginger for a few minutes over medium heat in a small saucepan (approx. 1 l). Switch to low heat and add the bean paste and miso and stir for a minute. Add the mirin and stir until the mixture is smooth. While stirring, add the sesame seeds and then the soy sauce. Add the soy milk and the dashi. Increase the heat to medium, and heat until just below boiling point. Boil the ramen noodles for 4 minutes. Drain in a sieve, rinse briefly under cold water. Put the ramen noodles in a bowl, add the soup and add the toppings.